What if It's Not Psoriasis? Psoriasis Symptoms - What if It's Not Psoriasis? Rashes, spots, bumps. When you notice something on your skin, it can be hard to figure out what the problem is. Rashes often look alike, and lots of things cause them. And two people with the same condition may have very different symptoms. 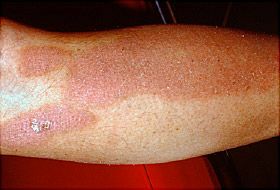 Parapsoriasis is the term for a group of rare skin problems that look like psoriasis but behave differently. Your doctor may need to take a sample of your skin (biopsy) to be sure of what you have. Like psoriasis, parapsoriasis shows up as a patchy rash. Spots are usually pink or red but also can appear brown or yellowish. They can be raised and bumpy with a scaly or wrinkly appearance. You typically get them on your chest, stomach, and back, but they also may appear on your arms and legs. They're generally round or oval but can be different sizes. You may itch, but you probably won't have any other symptoms. Small-plaque: Rash spots are less than 5 cm across. It's usually considered harmless. Large-plaque: Rashes are bigger and sometimes irregularly shaped. Some people with this form develop a kind of lymphoma called mycosis fungoides. It's a cancer of the white blood cells that starts in the skin. Some doctors consider large-plaque parapsoriasis a separate disease. Others think it's just an early stage of mycosis fungoides. These skin problems can look similar at the skin surface, but they are different under a microscope. The rash pattern of guttate psoriasis looks like parapsoriasis and also shows up on your chest. But it tends to come on after an infection. The plaque form of psoriasis may look like parapsoriasis when you first notice it, but it eventually becomes thick patches of flaky skin, usually on your knees, elbows, scalp, and lower back. Psoriasis is diagnosed most often in young adults and children and in more women than men. Most people who get parapsoriasis are middle-aged men. Your doctor probably will prescribe a steroid cream or other medication to put on the rash. Your doctors may recommend light therapy to help with your symptoms. It's usually done in a doctor's office or with an at-home unit that delivers a controlled dose of UVB light. Sunlight may help, too. Moisturizers can make your skin look better. The skin problem can last for months or years. Small-plaque may go away on its own. It should be checked about once a year, more often if it seems to change. Large-plaque doesn't go away without treatment. It should be checked twice a year because of its potential to become cancerous. You may need a biopsy every so often to see if it's progressed to lymphoma. Lewin, J. Dermatology Online Journal, published online 2012. UpToDate: "Parapsoriasis (small plaque and large plaque parapsoriasis)."